The cycling industry, and specifically the IBD, rely on a constant supply of professional and highly skilled mechanics. This project seeks to create a platform to encourage, educate and then certify current and future generations of professional bicycle mechanics. Create a system of education that is recognized by the cycling industry as a whole. In the present industry environment there are myriad fragmented and disconnected training opportunities for both full and partial career education paths. It is the PBMA's goal to bring all of these existing educational opportunities together under a central umbrella, in order to facilitate a standardized certification process. Having a published standard in place is the necessary first step to advance and acknowledge the individual professional's level of excellence. Create a system by which individuals can prove their knowledge though both training and testing. The PBMA is creating pathways to certification that take into account an individual's existing knowledge base, as well as allowing for advancement through continuing education. This creates opportunities for certification at an affordable cost to the individual mechanic. Create ongoing affordable education opportunities for the cycling industry with a focus on technical, professional and business knowledge. We seek to develop regional training programs supported by our various manufacturing and educational partners, facilitated and hosted by the PBMA. Creation of scholarship opportunities for underprivileged and/or underrepresented demographics within the cycling industry. One of the PBMA core values is to make bicycle mechanical training and advancement available to a wider audience. The trend with many industry skills is that there are fewer trained, competent technicians, so we are working hard to allow the cycling industry remain ahead of that curve. The purpose of this Call to Action is to begin the process of developing an industry standard minimum acceptable baseline for the position of “professional bicycle mechanic” with the potential to expand the title with additional endorsements and levels of proficiency. 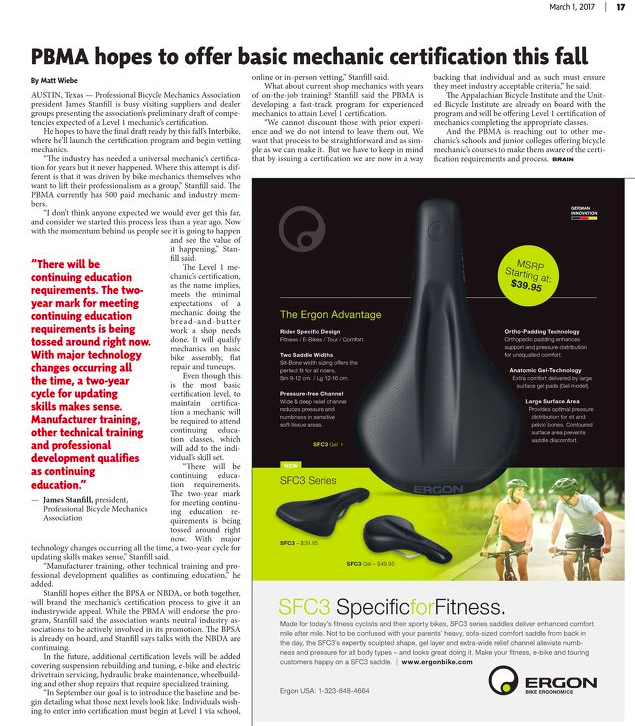 The PBMA is inviting representatives from throughout the cycling industry to partner with the Association in building out a coalition to develop an initiative for establishment of a Professional Bicycle Mechanical Certification. Through its membership, the PBMA has rapid access to data from mechanics across the industry. This data details work history, training opportunities and experiences, and general employment information from a wide spectrum of current professionals. Development of a “minimum standard” for what the professional title “Certified Bicycle Mechanic” embodies. Development of industry standards to which bicycle mechanical schools, manufacturer technical departments and cycling educators can target curricula. Development of a vetting program for those mechanics who already have knowledge & experience and wish to “test-out” of the initial program. Development of opportunities for and organize regional learning and certification opportunities. Outline the eventual development of tiers of certification for the individual, service manager/writer and service center within which the individual professionals work. Establishment of a scoring system to quantify how those programs and elements are rated as either a Continuing Education Unit (CEU), additional certification or simply as credit for attendance. Establishment of CEU guidelines for quantity and quality over a renewal period and decide the length of the recertification period. Establishment of a standardized requirement for CEU durability and registration. Assure that overall development and implementation is an industry-wide collaboration, involving representatives of participating stakeholders. Collect, compile, and analyze data from current mechanics and industry professionals. Identify trends and gaps in technical and professional education for mechanics. Communicate the trends that the coalition has identified from its year-long study of mechanics, currently available training options and potential voids in that body of knowledge. Provide a response forum for our professional membership to be involved in the process. Creation of a communication structure to allow rap id evolution of concepts and best practices. Development of proprietary messaging that all channels of the industry can use to communicate about certification and professionalism in the Bicycle Mechanics’ world. Conduct in-person evaluations of training programs, personally experience and evaluate online training programs. Formal assessment of how fast technology changes in the industry. Deploy the first round of certifications. Test out certification requirements and CEU opportunities during the initial deployment.